Biotin is one of the B complex vitamins. This water-soluble vitamin is essential for turning the food you eat into energy, because it is needed to form the enzymes that break down carbohydrates, fats and proteins. Most prenatal vitamins don't contain biotin, but some pregnant women might need biotin supplements. Many pregnant women might be at least marginally deficient in biotin, according to a December 2008 article in "The Journal of Nutrition." Supplemental biotin can cure this deficiency, but getting too much biotin can increase your risk for miscarriage, so speak with your doctor before taking supplemental biotin to make sure you need it and take the proper dose. Symptoms of biotin deficiency include depression, thinning hair, facial rash, hallucinations, listlessness and tingling in your arms and legs. Biotin deficiency causes birth defects in rats and other animal species, and might cause birth defects in people as well, but evidence to support this is limited. The adequate intake for biotin for adults is 30 micrograms per day for adults, including pregnant women. Toxicity symptoms do not occur at this dose, so taking a prenatal vitamin that includes biotin might help pregnant women prevent problems due to biotin deficiency, according to the Linus Pauling Institute. Bacteria in your digestive tract produce some of the biotin you need. Other sources include yeast, liver, egg yolk, avocado, salmon, pork, cheese, raspberries and cauliflower. 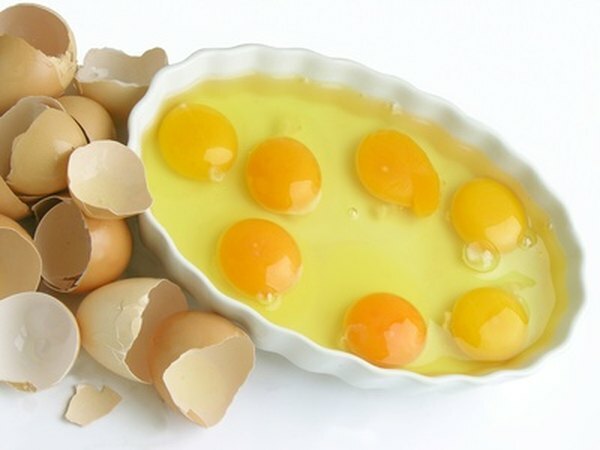 However, eating raw egg whites can interfere with the absorption of biotin. The substance responsible for this effect is destroyed when the egg is cooked, so cooked eggs do not interfere with biotin absorption.